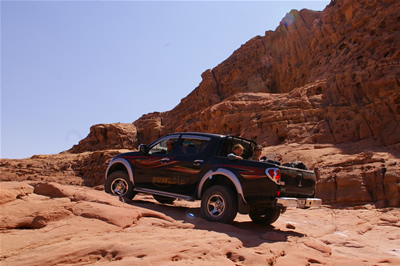 Wadi Rum Full Moon Camp&Tours operates a variety of different ways to see Wadi Rum, whether by jeep, camel or your own feet, we have the perfect option for you! 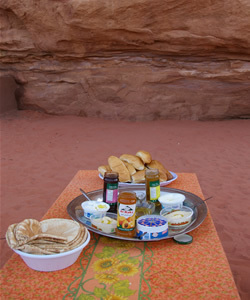 All overnight trips are in the Wadi Rum Full Moon camp and include breakfast and dinner of traditional, delicious bedouin food. We will have a campfire, bedouin music and storytelling. For this full day trip we will meet at the Visitor's Center and first go for tea and welcome at Tyseer's house in Rum Village. We start the tour with Shalala spring and the Nabatean temple which are about 40 minutes walking from the village and back. 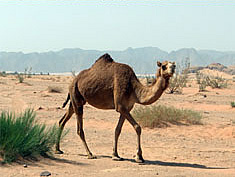 Then we start 1 hour camel ride through the protected area, to the Lawrence Spring. Then we continue by the jeep to Khazali Canyon with the 15 minutes break for the bedouin's souvenirs and traditional coffee with cardamon, then we move on to the Sand Dune for fun and sand-boarding, then to the Small Bridge, the Middle Bridge (Um Frouth) and the big rock bridge (Bourda), then we make a break for lunch and a little nap in the nice quiet shady place, then we continue to the Lost Mushroom Rock, the Lawrence's House, the Inscription and the Nabatean map of Wadi Rum. Then a short walk to see the sunset at the campground, followed by the traditional dinner at the Wadi Rum Full Moon camp and bedouin storytelling. We sleep in the tents, and in the morning we have breakfast and drive back to the village. We meet at the Visitor's Center and go for tea and welcome at Tyseer's house in Rum Village, then drive through the protected area, including the Lawrence Spring, Khazali Canyon, the Sand Dune and the Small Rock Bridge, the Midium Bridge (Um Frouth) and the Big Rock Bridge (Bourdah), Lawrence's House and the Inscription, followed by the sunset at the campground, then traditional dinner and bedouin storytelling. We sleep in the tents, in the morning after the breakfast we drive back to the village. We meet at the Visitor's Center and go for tea and welcome at Tyseer's house in Rum Village, then drive through the Protected area, including the Lawrence Spring, Khazali Canyon, the Sand Dune and the Small Rock Bridge, the Midium Bridge (Um Frouth) and the Big Rock Bridge (Bourdah), then we have a lunch and a short rest break and continue on to Lawrence's House, Barrah canyon and the Inscription.We will see the sunset at the campground, followed by the traditional dinner and bedouin storytelling. We sleep in the tents, in the morning we will have breakfast and drive back to the village. We meet at the Visitor's Center, go for welcome tea at Tyseers house, and then start by camels from Rum Village, visiting Lawrence's House, Khazali canyon and the sand dune, and then continue to the camp to watch the sunset. 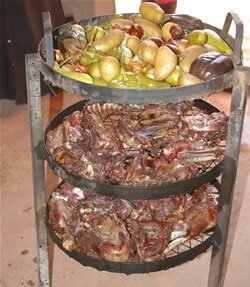 Then we have dinner, sleep, and after the breakfast in the morning we return to the village by Jeep. We meet at the Visitor's Center, go for welcome tea at Tyseers house, and then start from the village by camel to Lawrence Spring and Khazali Canyon, the Small Rock Bridge and then continue to the camp to watch the sunset and for dinner and sleep. After breakfast in the morning we go by jeep to see the sand dune and the Inscription, then Lawrence's House, Burdah Rock Bridge, Um Frouth Rock Bridge, followed by the lunch break, then we drive back to the village. Cost - 80 JD per person. We meet and the Visitor's Center and go for welcome tea at Tyseer's house in Rum village. We will start hiking with a bedouin guide to visit Lawrence Spring, Khazali Canyon, the Small Rock Bridge, followed by the lunch break in the middle of the day, and then we continue to the sand dune, Lawrence's house, finish up by the sunset in the campground, dinner, overnight and breakfast. In the mornng we will hike back to the village. Other equipment: You will also need a rucksack or shoulder bag for water, and such oddments as your camera, sunscreen, a light sweater according to season and perhaps some biscuits for a snack. Price : for 2-3 people 75JD per person, for 4 people or more 65JD/person. This includes all meals and sleeping equipment. Day 1. We start hiking from the Wadi Rum Visitor's Center through the Makharras Canyon to Um Ishrin valley, there we'll have a lunch break, then continue through Um Ishrin canyon to the sand dune and then to the cave where we're going to stay for the night with dinner and breakfast. Day 2. In the morning we'll start hiking through the sand dune to the Infishiya inscription, Lawrence's house, then the lunch break, then we continue to the Small Rock Bridge, then to Khazali canyon and by the sunset we come to the Wadi Rum Full Moon Camp for the overnight. We have dinner at the camp. Day 3. We start from the camp to the Burdah Arch and climb up the rock bridge, then we have the lunch at the foot of the bridge. After we continue to the Umfrouth Rock Bridge and come back to the camp for the night. Day 4. In the morning after the breakfast in the camp we'll drive you to the village. Climb the Um Addami - the highest mountain in Jordan 1835m from sea level. The tour starts at 9 a.m. from Rum village. We will start driving through the White Desert towards the border with Saudi Arabia to reach the mountain. We start scrambling up the mountain which is about 1,5 hour. From the top of the mountain you can see the Northern part of Saudi Arabia, and even the Red sea in the clear weather. After we go down for lunch break and then continue driving to see the Um Frouth Rock Bridge and the sunset in the Red desert. We go to the camp for the night, including dinner and breakfast and sleeping in the tents. In the morning we'll drive back to the village. Note: We have many different hiking programs, from 1 day to one week. Contact us for details and we can arrange a perfect program for your needs.